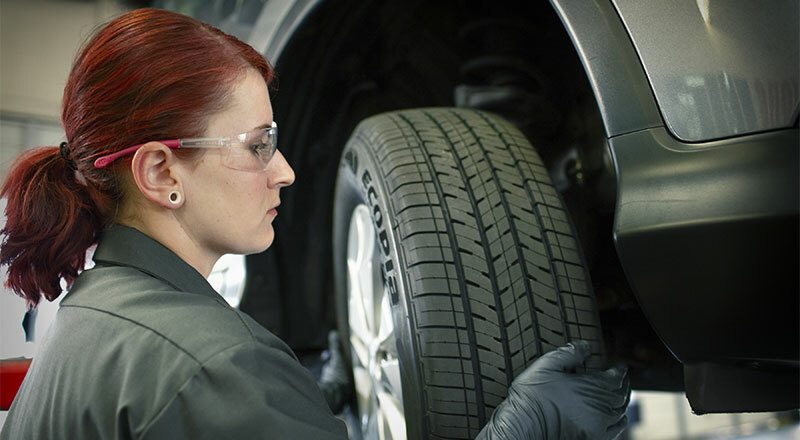 Shop the best tires in Wall Township, NJ at Firestone Complete Auto Care. We're the place to go for tire installation, mounting, balancing, repairs, and more! When it's time for new tires, Wall Township Firestone Complete Auto Care is the best place to go. Whether your trusty ride is a truck, car, crossover, or minivan, you'll find some of the best tire deals! We make it easy for you to pick the best set of tires for your climate, driving style, and vehicle. Explore our wide catalog online and shop tires from world-renowned brands like Firestone and Bridgestone. Then schedule your installation at a time that's convenient for you! From run flat tires to eco-friendly tires, Firestone Complete Auto Care is the tire place for you! How do you know when your tire wear has gone too far? We've got knowledgeable technicians ready to help, but you can do some investigating on your own. First, check your current tires for tread wear. If the treads appear worn or shallow, your tires might have hard time getting a grip on the road. That's a safety issue! Keep an eye out for bulges, tears, bumps, or cracks in the tire sidewalls, and make note of the tire age. Your tread may look A-OK, but vehicle manufacturers typically recommend replacing tires every 6 to 10 years. It can be matter of safety, a top priority here at your Wall Township Firestone Complete Auto Care. Chart a course towards adventure or a more eco-friendly drive to work with the right tires your favorite tire place, Firestone Complete Auto Care. You'll get the size you need from the brands you trust most, including Firestone, Bridgestone, and Primewell. Trust us with your wheels and you'll get much more than professional installation and advice. You'll also receive free tread and pressure checks, as well as trustworthy tire patching and plugging, rotation, and alignment. We've been a choice tire shop in Wall Township for years, and a leading tire provider in the U.S. for close to a century. For experience you can trust, come to Firestone Complete Auto Care. Browse tires online and schedule your installation today! From state inspections to steering and suspension to headlight replacements, trust your nearest Firestone Complete Auto Care for your automotive service needs. We're an automotive shop, tire store, and car care center wrapped into one. Our skilled technicians believe in truly complete auto care. Regardless of the maintenance your car or truck needs, we will strive to make your visit satisfying. Experience the difference! Make an appointment for auto service in Wall Township, New Jersey today.